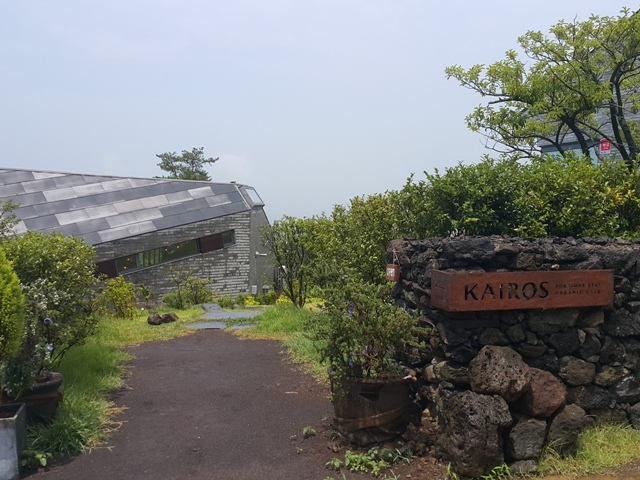 Situated up in the hills of Aewol, Kairos is certainly asking a lot of its visitors. However, people who choose to make the trip are treated to a unique brunch cafe with beautiful views and delicious food with an emphasis on quality ingredients. First up, the views. After leaving the main road (1136) from the city, the path to the restaurant passes through empty countryside and the odd watermelon farm. Upon arriving at the restaurant you have near uninterrupted views out over the Aewol countryside and down to the ocean below. The owner Soon Hwang-youn assures us that the view at night is even better. At the moment I can only imagine how the sunset and squid boats lighting up the ocean would look, although I’m certainly happy with what the daytime has to offer. The layout of the restaurant takes full advantage of its spot on the hill. It has huge glass windows that look out past the cafe’s small garden and onto the Aewol countryside before eventually stopping at the sea. The interior is small with an open kitchen and a piano in the corner the corner that hints at the evening concerts that they have recently started to put on. As a former textile designer, owner Soon Hwang-youn was able to transfer her design skills from textiles to the table and it all looks great. The restaurant is most well known for its brunch, served from 9:30 a.m. till 5:30 p.m., although they have recently started serving a simple evening menu with the option of steak (you must book in advance). After asking to try some of the restaurant’s most popular dishes we were served an avocado salad, a signature brunch; a bracken, steak, and cheese panini; and a ricotta and cranberry salad. The avocado salad was perhaps the highlight. 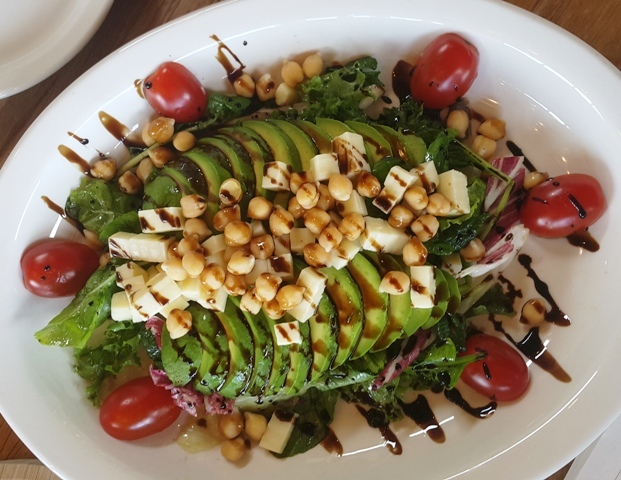 The perfectly ripe sliced avocado was covered in chickpeas, cheddar cheese, salad leaves, and a tangy balsamic dressing. Soon Hwang-youn explained to us that she was fed up with salad being a side dish and wanted her version to stand up as a meal on its own. The other dishes were also excellent in their simplicity. The bread used for the panini had a satisfying crunch while the steak, cheese, and bracken (from Mt. Hallasan) combined to give the sandwich a familiar, yet unique flavor. The ricotta cheese dish, the favorite of Soon Hwang-youn is a rich, thick, pile of ricotta cheese that has been stuffed with black beans and topped with cranberries. You are free to then spread this thickly onto the wholemeal bread that comes with the dish. In fact, a special mention needs to go to this bread. These crusty slices are bought from Le Escargot Bakery in Shin Jeju. They are crispy, light, and savory, and possibly the best bread I have tried on Jeju. Soon Hwang-young explained that while it would have been possible to use other bread, she wanted to ensure that all the ingredients were high quality. This philosophy shines through everywhere on the menu. The sausages were made by hand by a company based on Jeju, the panini bread comes from Denmark before being finished off in the restaurant’s ovens, the vegetables are all organic and come from Jeju were possible. Of course, this means that items on the menu run aren’t the cheapest. Salads come in at between 21,000 and 25,000 won while the paninis are between 13,000 and 15,000. All the salads (at least that we had), came with a side of the Le Escargot bread. The classic sign of whether a restaurant is any good is whether or not there is anyone inside and eating. This perhaps counts for double when the restaurant is miles away from pretty much anything on Jeju. And let me tell you, by the time we left at one o’clock, there was not a single table available. Soon Hwang-youn explained that the crowds are entirely natural. She hadn’t actually done any marketing but the restaurant took off on blogs on Korea’s Naver search engine a few months after opening and she has had a steady stream of customers since. Kairos serves its brunch menu from 9:30 till 5:30 and then steak and wine from 6 p.m. till 9.30 p.m. You must reserve if you want the steak.